As in all other cases of compact among powers having no common judge, each party has an equal right to judge for itself, as well of infractions as of the mode and measure of redress. The Kentucky Resolutions of 1798 were a series of resolutions written by Thomas Jefferson and passed as a group by the Legislature of Kentucky in response to the Alien and Sedition Acts. 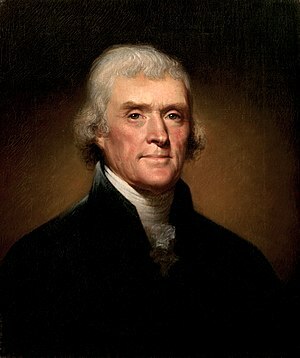 In the document, Jefferson argues for the compact theory and nullification: that individual States, being parties to the Constitution, have the right to judge the constitutionality of laws passed by the general government and thus to declare them unconstitutional and void. The Kentucky Resolutions of 1798 were accompanied by the Virginia Resolutions of 1798, passed by the Virginia General Assembly around the same time. Several states responded, denouncing the resolutions. As a result, Kentucky issued the Kentucky Resolutions of 1799 to reaffirm its position. Federalists held control of the United State government during its early years: George Washington was elected twice, and John Adams won a close election to follow him. Both appointed primarily Federalist judges, consolidating the party's power. The Federalists raised the ire of the Republicans in many ways, not least of which was refusing to support France in its war with Great Britain. Federalists claimed that the 1778 Treaty of Alliance with France was no longer in effect because the monarch with whom it was signed, Louis XVI, had been deposed in the French Revolution. Republicans disagreed, arguing that the treaty had been with the French people, and that the treaty remained in effect even if the French people decided to change their government. Washington pronounced it illegal to intervene on behalf of either combatant – an unconstitutional usurpation of executive power, according to the Republicans – and in 1795, Jay's Treaty was signed, strengthening the United States–Great Britain relationship. France attempted to disrupt trade between the nations, leading to the the Quasi War with France in 1798 and associated military buildup. Republicans also felt that the Federalist-controlled Supreme Court was overreaching, first with regards to taxation in Hylton v. United States and especially with its ruling against Georgia in Chisholm v. Georgia (the case was quickly overruled by the 11th amendment). Furthermore, the Federalists were passing numerous controversial laws, including the Whiskey tax (which led to the Whiskey Rebellion), a law establishing the First Bank of the United States, and finally, the Alien and Sedition Acts. Republicans were especially concerned about the Sedition Act, as it imposed fines and jail time for anyone who said, wrote, or published anything "false, scandalous and malicious [...] with intent to defame the said government." The Act specifically penalized such speech against Congress (dominated by Federalists) and the President (also a Federalist), but specifically failed to mention the Vice President (that is, Thomas Jefferson, a Republican). Matthew Lyon, a US congressman from Vermont, was among those punished under the act – he was sentenced to four months in prison and a $1,000 fine for writing one letter and publishing another that criticized President Adams. The Democratic-Republicans, lead by Jefferson, Madison, and John Taylor of Caroline, considered the options available to them. Taylor was considering secession, but Jefferson disagreed, believing that nullification, along with upcoming elections, would be enough to reverse the Federalist course. With this in mind, Jefferson secretly sent a series of resolutions to the Republican stronghold of Kentucky, to be passed by its legislature. The sovereign states formed a compact with each other, called the Constitution of the United States, to create a general government with limited powers, and all powers not granted to it were retained by each state. Whenever the general government takes undelegated powers, they are "void, and of no force," and furthermore, because the compact was made between the states, each state retains the right to judge for itself the constitutionality of the actions of the general government. The Constitution gives the general government the power to punish certain enumerated crimes; given the principle of limited government and the 10th amendment, all other punishments, including those found in the Sedition Act and the Bank Fraud act, are "void, and of no force." Given the principle of limited government, the 10th amendment, and the 1st amendment, the Sedition Act, in that it abridges the freedom of the press, is "void, and of no force." Power over "alien friends" is not granted in the Constitution to the general government, therefore the Alien Friends Act is "void and of no force." The Alien Friends Act violates the immigration clause of Article 1, Section 9, and is thus void. The Alien Friends Act is furthermore void because it takes the judicial power from the judiciary and gives it to the president, and because it allows the president to deport an "alien friend" without due process (5th amendment) or a proper jury trial (6th amendment). That clauses such as the General Welfare Clause and the Necessary and Proper Clause, being "subsidiary only to the execution of the limited powers, ought not to be so construed as themselves to give unlimited powers." That the representatives and senators from Kentucky in the United States Congress should attempt to repeal the above acts. That the governor of Kentucky should send out these resolutions to the other states, assuring them that Kentucky supports the preservation of the constitution and of limited government. The response by other states to the Kentucky Resolutions of 1798 was universally negative. In many cases, the responses expressed outright support of the Alien and Sedition Acts, and only one state – Vermont – challenged Jefferson and Madison's compact theory of the Constitution. The constitution does not contemplate, as vested or residing in the Legislatures of the several states, any right or power of declaring that any act of the general government "is not law, but is altogether void, and of no effect;" and this House considers such declaration as a revolutionary measure, destructive of the purest principles of our State and national compacts. Delaware's legislature called the resolutions a "very unjustifiable interference with the General Government," while the Connecticut General Assembly said they were "calculated to subvert the Constitution and to introduce discord and anarchy." Connecticut went on to defend the Alien and Sedition Acts, saying that they were "wisely calculated [...] to establish justice, insure domestic tranquility, provide for the common defence, promote the General welfare, and secure the blessings of Liberty." The states of New York and New Hampshire responded to both Kentucky's and Virginia's Resolutions of 1798 in the same documents. New York called the resolutions "inflammatory and pernicious" and called their "sentiments and doctrines no less repugnant to the Constitution of the United States, and the principles of their union, than destructive to the federal government, and unjust to those whom the people have elected to administer it." New Hampshire stated it believed the Alien and Sedition Acts to be constitutional, but in any case, argued "that the state legislatures are not the proper tribunals to determine the constitutionality of the laws of the general government; that the duty of such decision is properly and exclusively confided to the judicial department." Both houses of the New Jersey legislature rejected the Kentucky Resolutions, as well as the Virginia Resolutions, though some in the Democrat-Republican minority expressed support for them. In Massachusetts, the rebuke against the resolutions was nearly unanimous—32–1 in the Senate—and the responses of Rhode Island and Connecticut had similar levels of support. Vermont also rejected the resolutions, with a 2–1 majority in the assembly. In the South, no state responded to Kentucky's Resolutions. North and South Carolina both seemed sympathetic to them, but did not issue anything official in support. Of Georgia and Tennessee, little can be said other than they did not issue responses. Kentucky responded to the states that denounced them with the Kentucky Resolutions of 1799 in November of that year. This document reaffirmed Kentucky's commitment to opposition of the Alien and Sedition Acts, and its wording went even further: this time, the legislature explicitly said that "nullification [...] is the rightful remedy" in response to "unauthorized acts done under color of that instrument [the constitution]." These resolutions were largely overlooked, as George Washington's death coincided with their release. The Principles of '98, as the principles of the Kentucky and Virginia resolutions became known, appeared numerous times in American history since their original statement. In the early 19th century, they were used in opposition to the War of 1812 and federal funding for internal improvements, and they played a role in the South Carolina Nullification Crisis. The Kentucky Resolutions of 1798, in particular, formed the basis of the Wisconsin legislature's resolutions against the Fugitive Slave Act and the Supreme Court's attempt to enforce it in Wisconsin. The several states composing the United States of America are not united on the principle of unlimited submission to their general government; [...] they constituted a general government for special purposes, delegated to that government certain definite powers, reserving, each state to itself, the residuary mass of right to their own self-government; and that whensoever the general government assumes undelegated powers, its acts are unauthoritative, void, and of no force. Words meant by the instrument to be subsidiary only to the execution of the limited powers, ought not to be so construed as themselves to give unlimited powers, nor a part to be taken as to destroy the whole residue of the instrument. These and successive acts of the same character, unless arrested on the threshold, may tend to drive these states into revolution and blood, and will furnish new calumnies against republican governments, and new pretexts for those who wish it to be believed that man cannot be governed but by a rod of iron. Free government is founded in jealousy, and not in confidence; it is jealousy, and not confidence, which prescribes limited constitutions to bind down those whom we are obliged to trust with power. Anderson, Frank Maloy (1899). "Contemporary Opinion of the Virginia and Kentucky Resolutions". The American Historical Review 5 (1–2): 45–63, 225–52. http://en.wikisource.org/wiki/Contemporary_Opinion_of_the_Virginia_and_Kentucky_Resolutions. Elliot, Jonathan, ed (1907) . Debates in the Several State Conventions on the Adoption of the Federal Constitution (2nd ed.). Lippincott. http://en.wikisource.org/wiki/Debates_in_the_Several_State_Conventions_on_the_Adoption_of_the_Federal_Constitution. Woods, Thomas E. (2010). Nullification: How to Resist Federal Tyranny in the 21st Century. Washington, DC: Regnery. ISBN 9781596981492. This page was last edited on 21 May 2015, at 18:08.